Sounders are a vital part of every fire alarm system. They ensure that everyone is alerted to the possible presence of a fire, whether it’s been set off by a detector or at a call point. Often you can choose a sound which is most appropriate for its location, and can even control the volume. That way, you can have it louder in noisier environments and a bit lower in a quiet office. The red fire alarm sounders are common place and easy to recognise. However, there are also other options available so you can still place the sounder where aesthetics are important. Fire alarm bells look and sound similar to those rotary fire bells we are perhaps more accustomed to from days gone by. But they when part of a fire alarm system, will sound in unison immediately, working like an ordinary sounder. Make sure everyone knows what the alarm sounds like, so that there is no confusion should the alarm sound in an emergency. And if you use the bells for other warnings as well, such as in schools, ensure all know what different alarm types mean and sound like. 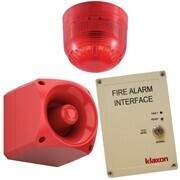 When used as part of a fire alarm system, beacons should be used in conjunction with sounders. That way, you are providing a method of warning to everyone around, regardless of the environment. For example, in a factory you can be certain that the alarm is raised even when there is a high level of noise, or wearing ear protection. Additionally, they also alert those with a hearing impairment. You can adjust these to suit the needs of different areas of your premises, such as the flash rate. It is also a good way of communicating general signals as well. Beacons should be used in conjunction with sounders as a way of ensuring that everyone becomes aware of the alarm, regardless of the environment or personal impairment. With a combined sounder beacon, you incorporate both devices into one unit. This makes it less obtrusive, but also helps to reduce the cost of fitting as it only requires one point of installation.